This is another tea from Aura Teas, and once again I am pleased. To be candid, I haven't tried many baozhongs, nor do I think I really possess much ability in distinguishing them. Still, I'm pretty confident this is a good tea. 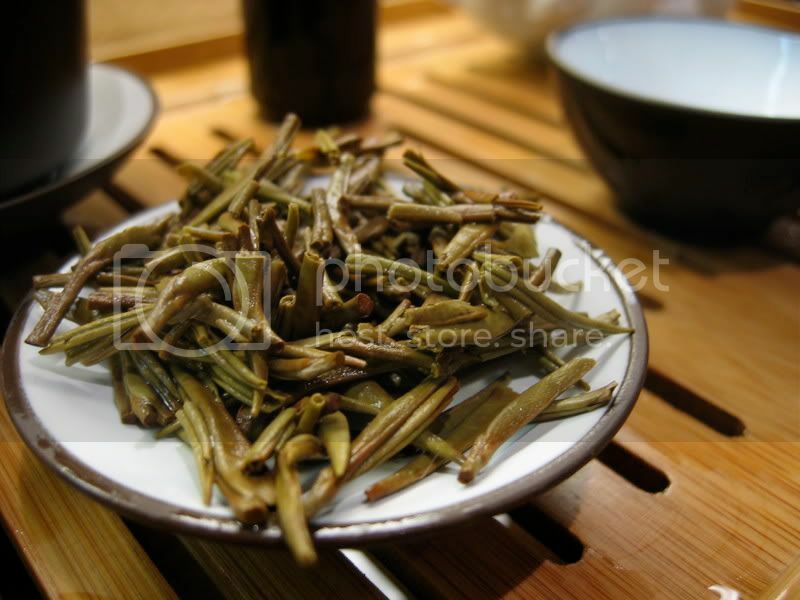 The dry leaves are– in true baozhong form– long, twisted, and bright green. As a side note, I think baozhong leaves are some of the most aesthetically pleasing out there (as an aside during my side note, "aesthetically pleasing" may indeed be the most diluted, sterile way to say "beautiful," but I felt like a change of pace). I didn't think to take a whiff of the dry leaf– oops. I used the whole packet, around 6g, in one shot (in a 100mL gaiwan). I don't know if it's just me, but I like baozhong brewed with lots of leaf. 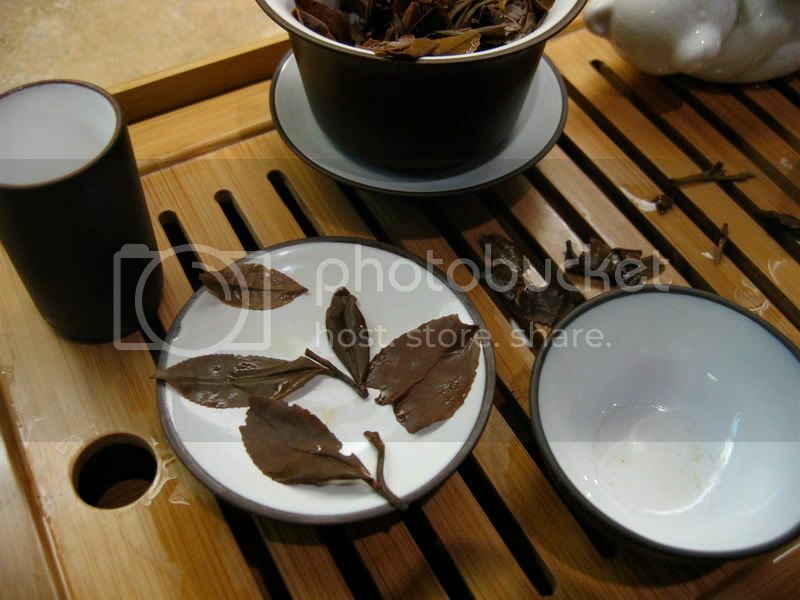 I try to gauge it so the leaf comes just up the gaiwan lid when wet, but not enough to lift the lid at all. I also use boiling water, even though it looks fairly fragile, and roughly 30s infusions. It may sound like this would be murderously strong (or maybe not), but it's really not. On the contrary, there is only the slightest floral/clean astringency. I think I've mentioned this before, how sometimes astringency can taste similar to the taste of perfume– not related to scent, just the feeling on the tongue when you walk through a cloud of it. Regardless, I imagine you could brew this tea without any astringency if you prefer, just use less leaf. This tea tastes of orchids, veggies, and honey. There is a bit of a milky note in the first infusion, as well. There is a good floral aftertaste, and a cooling sensation in the throat. 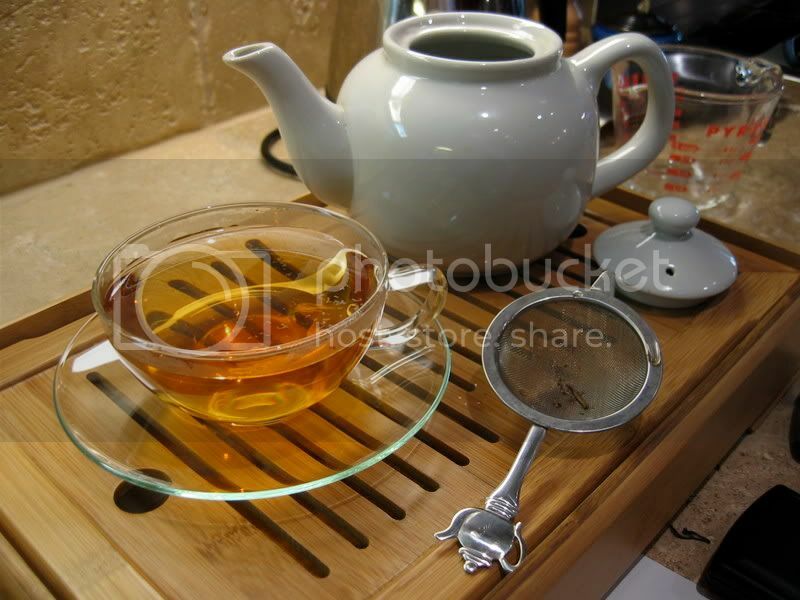 This tea putters a long for a decent number of infusions– it starts to weaken after the third, but makes it to at least 5 with significant and still-enjoyable flavor. Another winner from Aura Teas, it seems. If you can afford it, I would definitely recommend trying this baozhong. Though expensive, it is full of good flavor. To take a slight detour from the tasting notes, I discovered a new technique with this tea that I thought I'd share. It requires that the cup be filled close to the brim, so smaller cups probably work best. It's not difficult and many of you may have already noticed it, but taking a deep breath with your mouth near the tea, before taking a sip, sometimes allows you to taste higher notes better. It seems to be chance when it *really* works– it often helps a little bit, but occasionally something dramatic happens. With this tea, one of the times I tried this I got a sudden and specific "ORCHID!" taste, but the other attempts were nothing that special, but still nice. Anyway, I hope some of you find this fun/helpful/interesting. Aura Teas recently contacted me about trying some of their teas and writing about them, and as usual I was quite willing to do so. :) I have only had time to sit down and seriously taste one out of the four samples they sent, but so far I'm pretty impressed. This is a traditional-style Dong Ding which, from what I understand (please correct me if I'm wrong) [Edit: No big surprise– I was. Traditional-style is both high roasted AND high oxidized. Thanks Stéphane! 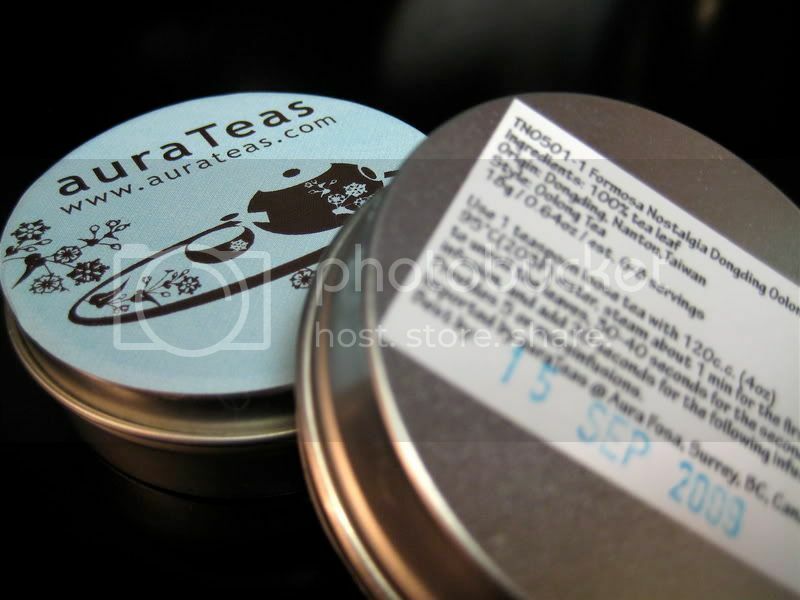 ], typically means the tea is less roasted and more oxidized than its newer brethren. The wet leaves showed some evidence of this (slightly browner, correlating with more oxidation; more supple/less rigid suggesting less roasting). The tea wasn't what I expected, which was a good thing in this case. The low-medium roast Taiwanese oolong I have had in the past has been just like low-medium Tie Guan Yin but with less body, but this was different. I brewed it in my typical balled-oolong way, with about 5g of leaf in a 100mL gaiwan and off-boiling water for around 30s (give or take) each infusion. The result was grainy (in flavor, not texture), notably fruity, and sweet. There was good thickness and oiliness on the tongue, it was cooling in the throat, and had a long, sweet aftertaste. All in all, quite delicious! The only problem was that it only lasted for 3 infusions before it started to weaken, but this is forgivable. One more brief and probably unimportant note: look how cool their packaging is! Probably the nicest I've seen anywhere, heh. I look forward to tasting the other offerings Aura Teas sent me, especially if they're all this good. Of special note is their "Natural Wuhe Honey Black Tea," which should be interesting as I've never had Taiwanese black tea before. Tie Guan Yin: you've heard the name, and likely quite a few mistranslations. I'm willing to bet you've been thinking, "By golly, I sure wish someone, preferably a strapping young lad, would write a post about the Buddhist themes behind Tie Guan Yin!" My readers, today is your lucky day. "Tie" means iron, and "Guan Yin" (lit. "Observing the Sounds/Cries of the World") is the Chinese name given to the Indian Buddhist figure Avalokiteśvara, the bodhisattva of compassion (It is also the name of a similar figure in the Daoist tradition, but it is commonly understood that this Daoist figure was lifted from Buddhism). A bodhisattva, in short, is a very advanced being who is nearly enlightened but not quite there (essentially, the state right before Buddha-hood), who compassionately aids other beings on their paths to enlightenment. There are a number of bodhisattvas in the Mahāyāna* traditions and Avalokiteśvara/Guanyin is one of the most popular ones. Interestingly, Avalokiteśvara is male in his Indian depictions, but becomes represented as female when imported into Chinese culture. Importantly, a bodhisattva is not the same thing as a god/goddess. I often see Tie Guan Yin translated as "Iron Goddess of Mercy/Compassion," but it is more accurately translated (In Buddhist context, anyway) as "Iron Bodhisattva of Mercy/Compassion." In the Buddhist hierarchy of beings, gods are not necessarily any closer to enlightenment than a human, animal, or any other being– they have just earned more good karma in their previous lives. At the risk of this becoming an irritatingly long post, I will also briefly describe the legend of the tea, Tie Guan Yin. A poor farmer was dismayed by the poor condition of the Guanyin temple (with an iron statue of Guanyin) near his home. He wished to repair it, but had not the resources to do so. Doing what he could, he instead brought frequent offerings of incense and swept the floor of the temple. One night, the bodhisattva Guanyin appeared to him in a dream, telling him that there is a treasure for him and his neighbors behind the temple. The farmer looks and finds a lone tea plant, and takes it back to his farm, where he cultivates it into a tea bush, which produced spectacular tea. 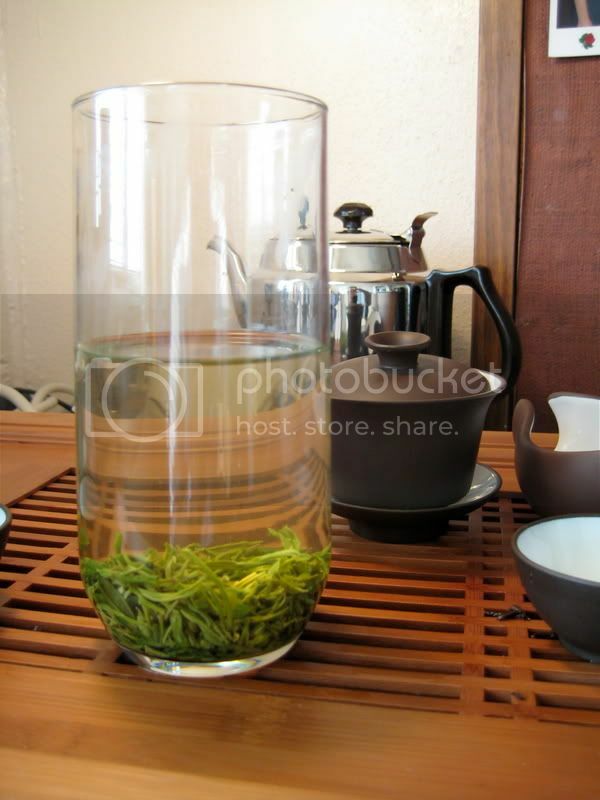 He gave cuttings to his neighbors, and they sold the tea as "Tie Guan Yin." Eventually, of course, there is a happy ending: the farmers grow prosperous, and the temple is rebuilt. Hooray! As for the legitimacy of the legend, who knows. All that really matters to me is that we have it now, and it is darn tasty. 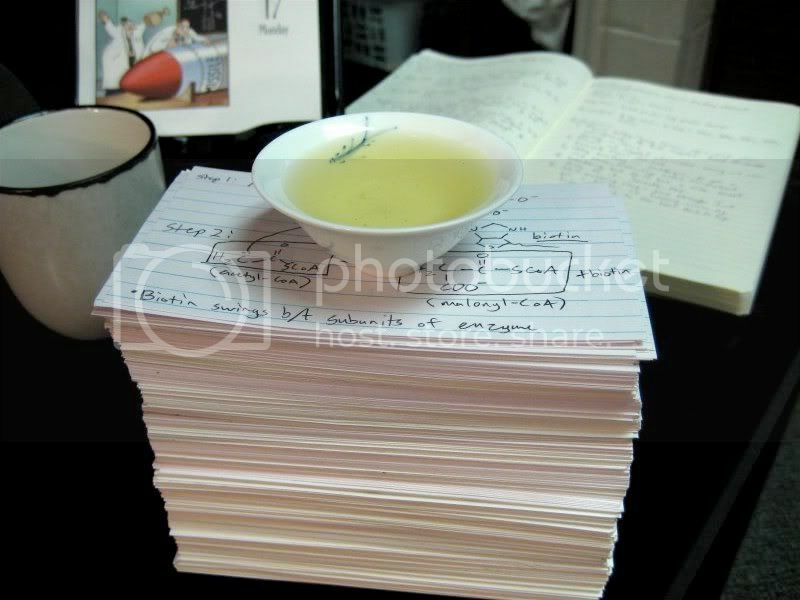 So, without further ado, my notes about Jing Tea Shop's Anxi Xi Ping Tie Guan Yin. This post is already hideously long, so I won't say too much. This is a good tea, for sure. The aroma of the dry leaf is toasted grains with light fruit and flowers. Has a "breakfast-y" aroma, if that's a word. (I suppose just "breakfast" is descriptive enough without the "-y" attached.) The leaf looks a little ragged, to be honest, but I'm thinking it might be more loosely-rolled than most TGY, because the wet leaf seems to indicate this is more than just dregs from the bottom of the barrel/bag/bucket/misc. storage device it came from. 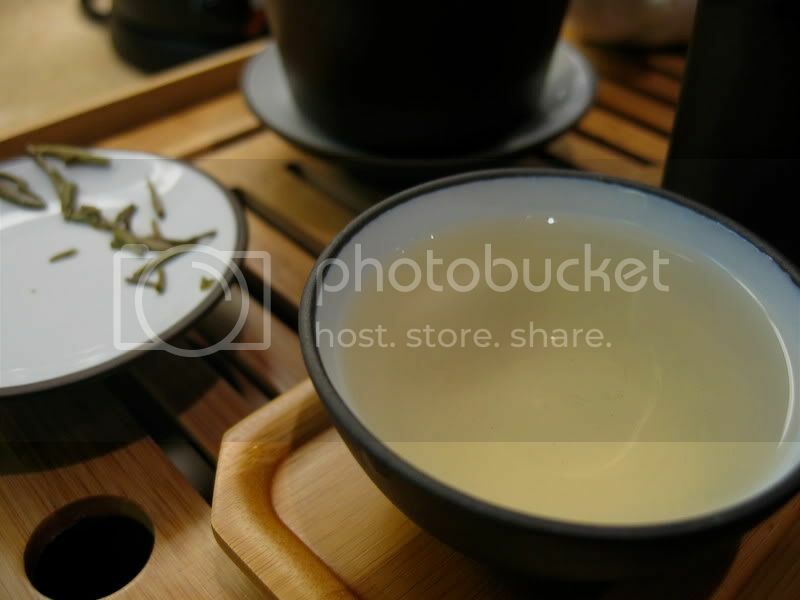 Parameters: 100mL zisha gaiwan, 5g leaf, off-boiling water. Steeps around 30s. The liquor is similar to the aroma: toasted grain and floral, with a bit more floral character and a pleasant astringency coming out a few infusions into the session. Not the most complex– not nearly as complex as the Gan De TGY from Jing I had a while back– but a good, solid, tasty tea. Actually, this is a perfect example of how more complexity doesn't mean better. I enjoy drinking this TGY far more than the Gan De, even though the Gan De was one of the more complex teas I've ever tried (which, admittedly, isn't that many, but you get the point). Anyway, that's it for now. Expect more Buddhism 101 when I get around to some other teas with Buddhist names (Tie Luo Han, for one, but I'm guessing there are others out there). Hope you enjoyed it! Same nerdy goodness, new location! Hey all, Tea Nerd can now be found at http://www.teanerd.com! Any old links to http://teanerd.blogspot.com (or any posts) will still work, so don't bother changing links or bookmarks. Enjoy the new, shorter, spiffier URL! 2007 Fukamushi Sencha "Super Premium"
It's been a while since I posted any notes about sencha, so here goes. I just got this tea today, so I don't have a lot of experience with it, but I liked it enough the first time around to write about it. The dry leaf is, well, fukamushi. It doesn't look pretty. This is just a result of the deeper steaming, though, so it's nothing to worry about. The aroma is a bit grassy, vegetal, and "marine." Mmmm! I brewed this with more leaf than I would normally, on Chip's recommendation. I used 5.7g leaf (There wasn't much thought involved in picking this number, by the way, it's just what looked good at the time) and 200mL of 165-170°F water, and steeped for 60s, 30s, 50s, and 90s. The liquor brews to be a lovely emerald color, even without the help of the cloudiness, which sets in starting with the second infusion. The flavor is sweet and candy-like, though frankly it was a bit weak considering the amount of leaf I used— perhaps a higher temperature would help that. There is a touch of astringency, but that is likely a result of my own brewing and not the tea's fault. The second infusion especially had a rich umami goodness, which made the tea feel quite robust in the mouth. One of the things I like about this tea is that it is more "active" than other senchas, in that it leaves a coolness in the throat and a pleasant oily sensation on the tongue. This does happen in some other senchas, but not usually this much. By the fourth infusion, it started to get a bit watery. If you bumped up the temperature this tea could probably keep going, but I doubt it would be much longer. Anyway, I very much recommend trying this tea. It's not an everyday drinker at the price of 15 clams for 40g, but it's a nice treat. This is one of the more interesting and puzzling teas I've come across lately, and it doesn't help that it is also in a category of tea I have just begun to explore. Anyway, on to my notes. As soon as I opened the bag, I knew it was going to be an interesting experience drinking this tea. Smells of various spices, molasses, and notably peppermint blasted their way into my nose. After the initial reaction of "what the hell?" I remembered fellow bloggers commenting on the "spice" aroma of Red Blossom's aged sheng puerh. Are these things related? A common storage issue, perhaps? Anyway, such inquiries are purely speculative and presumably not why you are reading this, so let's continue. Most of the spice seems to disappear once water hits the leaf, but the mint carried on well into the session. Actually, it was a pretty short session-- this tea didn't seem to have much endurance, at least not in my first attempt to brew it. With 6.5g of leaf in a 100mL gaiwan, it only went for 5 good infusions before getting weak. What struck me about this tea was how much it tasted like puerh. I don't have the experience to say whether it tasted more like aged puerh or shupu, but it was in that range. It was not at all what I expected. It had a smooth texture, earthy, malty flavor and aftertaste, and mint like I mentioned earlier (The mint wasn't at all like the camphor I've tasted in some puerh, in case you are wondering, it almost tasted like it was flavored). This tea really didn't even begin to taste like a typical aged oolong until the end of the session, though the wet leaf and gaiwan lid smelled like oolong the whole time– weird. There was a good throatiness to the tea, and left a tingling minty taste/flavor on the back of my throat. There may have been some qi, but I wasn't sweating so it wasn't too strong. Once I got past the weirdness, I decided that I do like this tea. I'm not sure I would buy a lot of it, but it is certainly good for switching things up a bit every now and then. 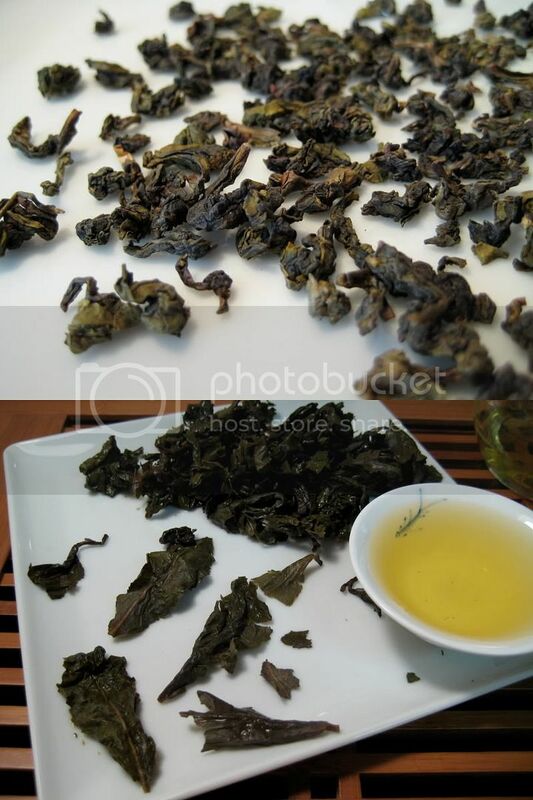 It has been a while since the Teacuppa online puerh tasting, and I remember hearing back then that their focus was more on Wuyi yancha and not on puerh. I have tasted about a half dozen of their Wuyi offerings now, and I can confidently say that they know their stuff when it comes to yancha. I suppose it's a bit ironic that I would happen to feel like blogging at the same time I brewed up my least favorite sample from them, but that's the way the cookie crumbles, I suppose. The dry leaf is lovely in both appearance and fragrance: the leaves are dark, and there is a classic deep chocolate aroma, with the slightest hint of tropical fruit and spice. I decided to brew this fairly conservatively, with 6 grams of leaf in my 90mL yixing and long steep times (20 seconds to 2 minutes). The first infusion, after a flash rinse, was pretty good. It was hearty, with a good amount of "fire," hints of tropical fruit, and a base of cocoa/coffee. There was even a healthy fruit aftertaste. After that, though, things went downhill quickly. It was thin, weak, and a bit sour. I'm thinking this tea probably needs more leaf to express itself best, but unfortunately I only got a 15g sample so there's not a lot I can do. The wet leaf is mostly chopped up, with a few long leaves here and there. Overall, I'd say this is just a mediocre tea. Not bad, but not great either. As I mentioned before, it is a shame that I felt like blogging as I tasted this. I'll get around to posting about the other Teacuppa yancha samples someday, but until then, I should say that this is the first one I wasn't thrilled with— all the others have been very good, and I recommend them wholeheartedly. Hey all, sorry for the lack of posting. Between school and medical school application essays, I've been swamped lately. I'll continue my Lochan reviews soon, no guarantee when though. Thanks for your enduring readership! Continuation of the Lochan Tea Ltd. sample tasting. •2007 Jungpana Organic Imperial Delight Muscatel 2nd Flush. For these teas, I employed the same parameters I used for the previous group: 5.0g, 12 oz. of off-boiling filtered tap water, glass teapot, and 2:00 (minutes, not hours). The dry leaf here is fairly standard-looking for a Darjeeling; it smells like wood, flowers, muscat, and apple. Mmm! The liquor is the solid orange-amber I've come to expect from 2nd flush Darjeelings. It has a pleasant thickness in the mouth. It is sweet, with a lovely muscatel flavor. There is only a hint of woodsiness, and just enough astringency to leave a lingering hui gan on the tongue. There is quite a strong aftertaste which tastes of muscatel and, curiously, apple juice. I wasn't so much surprised that there was an apple flavor, since I thought I smelled it in the dry leaf, but I was impressed by just how much the aftertaste tasted like apple juice. This is an excellent Darjeeling-- probably my favorite of the bunch (so far, anyway). A sweet floral and fruity aroma is emitted from the dry leaf, and hints of wood and spice can be detected upon closer inspection. The leaves (shown left, below) show good color and size. This liquor is slightly lighter than the Lochan Muscatel's, but it is still a deep amber. To compare flavors to music, this tea is predominantly composed of high notes. It is noticeably sweeter than most Darjeelings I've tried, and also quite crisp. There is a good muscatel note, complemented by a touch of vanilla and some wood/herb. There was a bit of an unpleasant alkaline flavor in its woodiness, but otherwise I thought this tea was very good. This tea was, by far, the most unique of the bunch. I'm not sure if I like it more or less than the 2007, but it is certainly an interesting diversion from the other more similar Darjeelings. 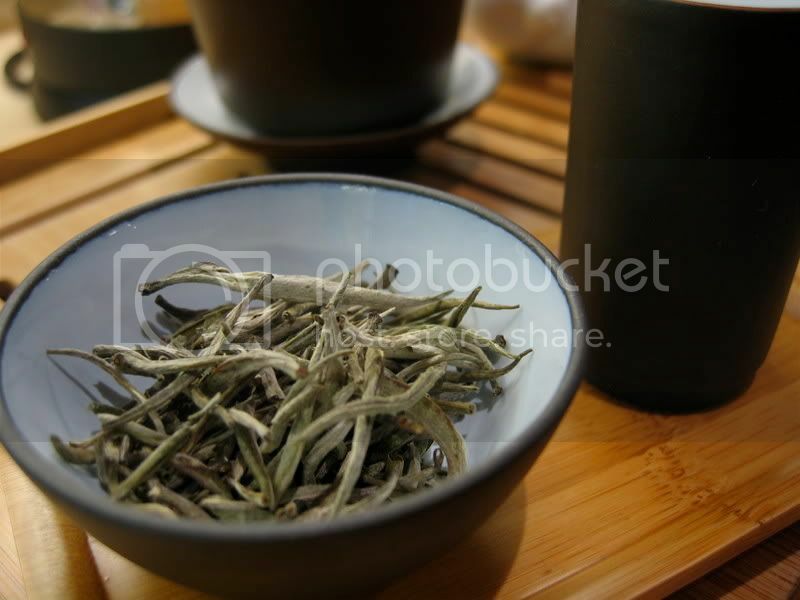 The fragrance from the dry leaf is much more profound, smooth, and rounded than that of the 2007 teas. Apples, grapes, and wood/flowers dominate. The leaves look a bit browner than the 2007 Margaret's Hope, but they also seem a bit more whole. The liquor is a mystery. While it is the same amber color, the flavor is quite obviously different. What isn't so obvious is how it is different. It is sweet, and significantly stronger in its fruit and floral flavors— the muscatel really stands out. I think. It's hard to say whether the flavors are stronger or just less obstructed by the general "tea" flavor. There is little astringency, and not much of a hui gan or aftertaste. Overall, a very interesting and enriching gustatory and olfactory experience. I'll definitely be drinking more of this one. These dry leaves also had a rounder, fuller aroma, much like the 2006 Margaret's Hope. Muscatel and flowers are predominant. 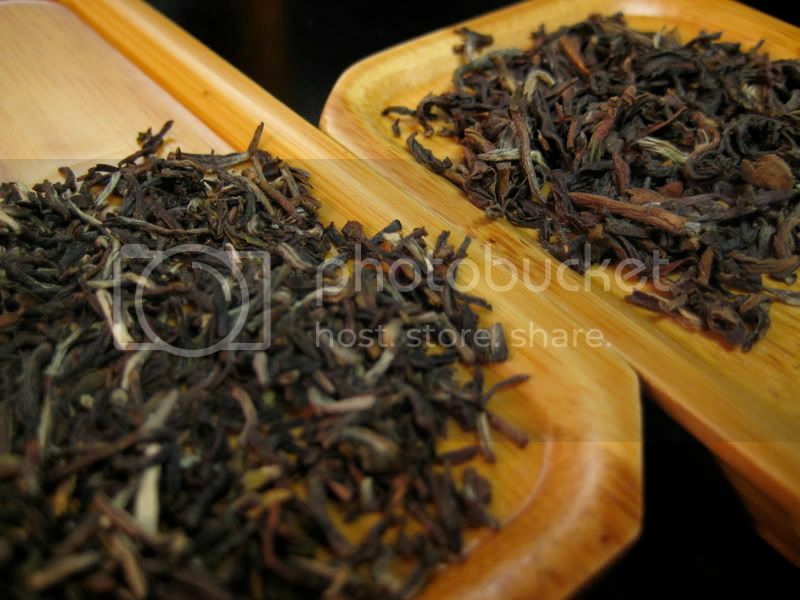 They are more whole (this is reflected in the wet leaf) and darker than most Darjeelings, too. Regrettably, this tea had to follow the previous three. It is very good, but sadly a bit thinner and flatter than the others. It has a crisp flavor, gentle astringency, and a good hui gan, but I don't notice anything unique like the others had. There is a muscatel note, but it's not as obvious. It's quite possible I'm just not doing justice to this one, but I don't think it's on the same level as the other muscatel delights. Still, just as the runners-up in the olympics are excellent athletes, this would beat the pants off most other Darjeelings. I enjoyed these teas very much, and because of my preference for strong muscatel flavor, I liked them more than the previous three. The Lochan Muscatel still stands out as the most solid of these, but the 2006 Margaret's Hope comes in a close second, with bonus points for uniqueness. 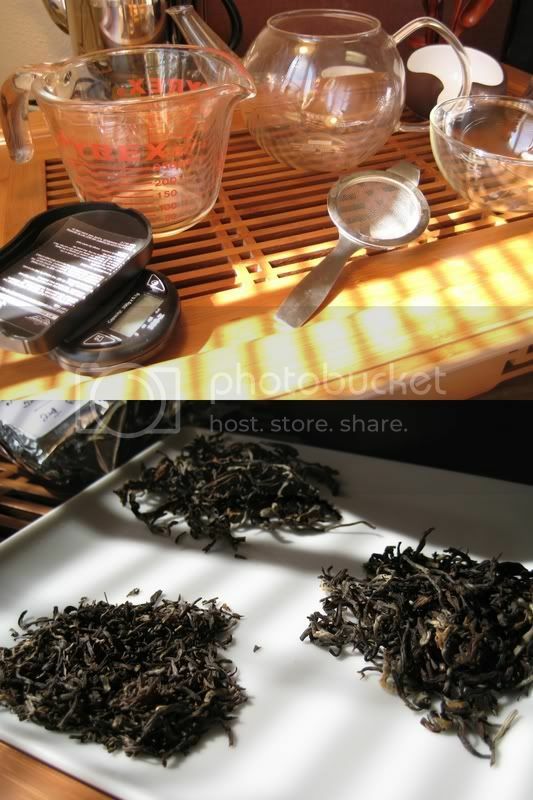 Stay tuned for more Darjeeling action, right here on Tea Nerd! It's time to post my first notes on the teas Ankit Lochan, from Lochan Tea Ltd., sent me. First though, I thought I'd break down my plan. As the title indicates, this post contains the introduction to the series and the first category of notes, "Second Flush Darjeelings." This particular title is a bit misleading as all the Darjeelings I received are from the second flush, but basically these are the teas that didn't fall into any of the other more specific categories. 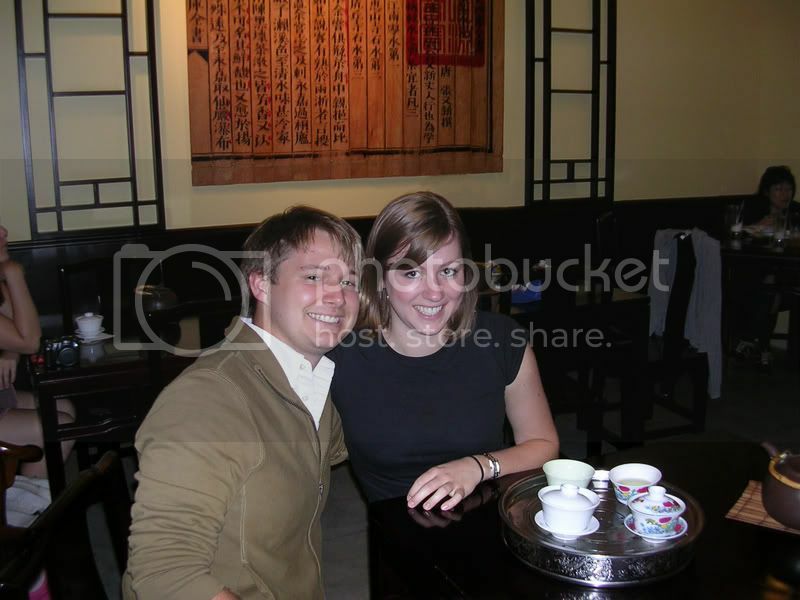 Sorry, the picture of this tea (left: top) came out pretty blurry. The leaves were typical of most Darjeelings— cut up (though not nearly to the level of CTC) and possessing a wide range of colors, from browns to tans to off-white buds, with the occasional green. This organic leaf gives off a bold aroma, and is intensely floral and woodsy. The liquor is a peachy orange-amber color. It is very floral (perhaps this is the root of it's name? ), has a medium body, and sweet flavor. There is some fruitiness and woodsiness in the background, and there is a crisp finish. Good stuff. Though this is enjoyable, there are better Darjeelings out there. I should point out that there are far more that are worse, though, and I would still consider this to be a good tea. This is the only non-organic tea in this category. The dry leaf is, well, true to its name, as you can see in the picture (left: middle). This leaf appears slightly more oxidized than the other two, as evidenced by the darker color (which is more obvious in person) and lack of anything green. The aroma is fairly similar to the Goomtee— floral and woodsy. Further evidence for this being a higher oxidized tea is the darker reddish-amber color of the liquor. 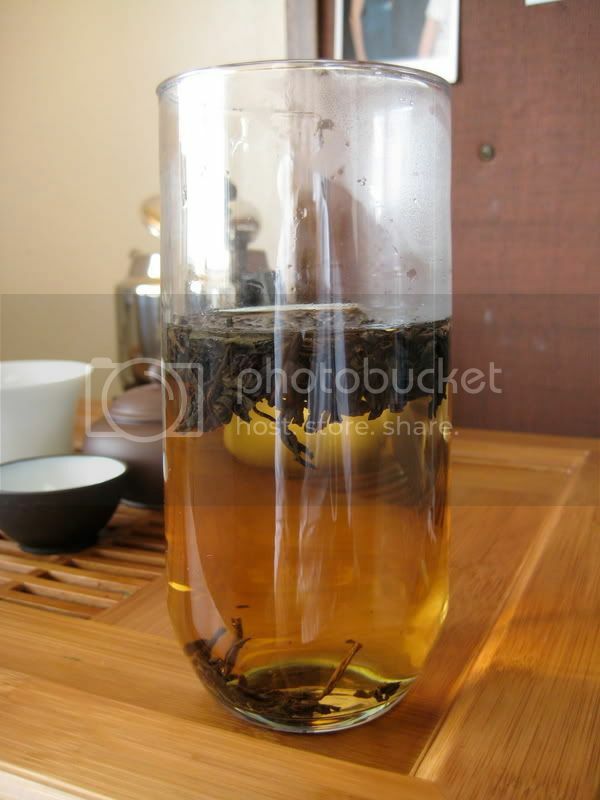 Though it is true to its delicate Darjeeling nature, it is relatively "heavy." Spice and woodsiness are emphasized, though there isn't really any dominant flavor. It is sweet and smooth tasting, with a mild hui gan. Like the Goomtee, this is enjoyable but not the best example of Darjeeling I have tasted. It is still quite good though, and the color of the liquor was a thing of beauty. This is one of the more "guilt-free" teas on the menu, as it is both organic and fair-trade. (Don't worry though, my icy heart remains impartial.) First off, I should point out the beauty of the dry leaf (left: bottom). These are the loveliest Darjeeling leaves I have ever seen. Apart from the usual bouquet of browns, tans, off-whites and greens, these leaves look long and full— an uncommon find. Though it is not pictured, the wet leaves reflect this with whole leaves and intact leaf/bud complexes. I wasn't expecting this from a Darjeeling! Strangely, the leaves emitted only a hint of aroma. What was there was floral, fruity, and slightly woodsy. Though this brews a light color— pale yellow with a touch of amber— it still has a good deal of flavor. I'm not sure if the lighter color is due to a lesser degree of oxidation or just the decreased surface area/volume ratio, but even when I bumped up the infusion time by a minute (to three minutes total), the color was only slightly darker. The brew holds a floral, delicate flavor and a crisp, clean texture. There is a refreshing minty aftertaste and a relatively strong hui gan here, as well. It is a bit on the light side in terms of flavor. Overall, I was impressed. The flavor may not have been the most thrilling so far, but the quality of the leaf was impeccable. I think I liked the Castleton the most, followed by the Makaibari and then the Goomtee, but I can't be certain that I unlocked all that each had to offer. So far I have been impressed by the quality of each of these teas, and look forward to trying the rest. I have already started to dip into the "Muscatel Delights," but all I can say, without spoiling the next post, is to stay tuned for some real gems. Thanks for reading! "In the early 1950s, Mr. Yao Yue Ming started a Da Hong Pao research laboratory. Using a few stems from the original 800 years old Da Hong Pao tea bushes, he successfully created two new tea varieties. However, Mr. Yao's laboratory was later closed down and his research was destroyed during the Chinese Cultural Revolution. Yet, he continued his research in secrecy and through his dedication and determination; he finally perfected his creation. He named this tea, Beidou No. 1." I think this tea was a good lesson for me. I had purchased it thinking "aged" necessarily meant dark and heavy. Stubbornly, I kept brewing it thinking that it must fit my expectations for an aged Wuyi, and I figured I just hadn't figured out how to unleash its true potential. Though the aroma of the dry leaf was of very rich dark chocolate and brown sugar and the liquor was moderately dark, the flavor was surprisingly exuberant and bright. My notes mention tart tropical fruits, some moderate roast/charcoal, cocoa, and at times blueberries and a mildly aged character. There was a mild, cooling hui gan after pretty much every infusion, and at times my tongue was ambushed by a strange and sudden (though pleasant) dryness. I had the most success with this tea when I used lots of leaf and short infusion times. The parameters I've had the most success with (so far) are 7g in my 90mL Yixing teapot with infusions starting at around 10 seconds, including water in/out. Using less leaf and longer times, as I would normally employ for Wuyi yancha, I just didn't get much body in the liquor. Whether this is a characteristic of the tea or of my brewing, I can't say. This tea was quite good, but it's not my favorite. It was interesting and multi-dimensional, but I tend to enjoy heartier Wuyi more. After hearing such glowing praise of this tea from Adrian and its somewhat more subdued approval from VL, I find it likely that I have misjudged this tea. For now, though, I'll give it a 7/10. The dry leaf has a lovely range of color, from brownish-green to green, with a few off-white tips. The aroma is surprisingly pleasant (again, I'm a noob, give me a break), and smells of dry, earthy mushrooms, but with a brighter citrus/acid and floral high note. *These times include pouring and decanting. In general, the liquor was sweet, light-bodied, mushroomy, and woodsy. There was a mild hui gan at times, and a strong drying astringency throughout the session, leaving my tongue battered and useless by the 5th infusion. I didn't think it was very bitter, just drying. The flavor of the brews seemed to be fairly consistent across all the infusions, though there seemed to be more sweetness with shorter brews and more dryness with longer ones. Though others seem to have thought this tea's cha qi to be ordinary, I, having never paid much attention to the concept, thought it was a mite overwhelming. Despite the air conditioning in my dorm, I broke out in a cold sweat during the second infusion, and felt quite heavy-headed by the end of the session. It was only unpleasant in that I didn't know what to expect. I was pleasantly surprised by this shengpu, as I have had some rather poor impressions of the shengpu genre in the past. I don't feel like I know enough yet to give this a rating, but I thought it was interesting and enjoyable. This time, I tried the "red" sample, and my impressions are as follows. Similar to the "green" sample leaves; consisting of greens, browns, and off-whites; though a bit more leaves fell into the brown range. This wasn't compressed as much as the green sample, and was mostly loose when I opened the bag. The aroma in said bag was pleasantly mellow and sweet, smelling of mushrooms (no tobacco or much else, from what I could gather). I didn't like this tea too much— it seemed quite fickle about steep time, and I frequently (read: all but twice) ended up with a strongly bitter and harsh brew. When the harshness wasn't dominant, the liquor tasted mostly of tobacco with a hint of mushrooms, which was quite a change from the dry leaf. Steven noted a similar difference between the liquor and the wet leaf, and I think he puts it best: "The wet leaves were like a spring time air while the brewed tea was like an autumn forest." There was usually a gently sweet hui gan, though this was masked in some of the more intensely bitter infusions. I should also note that there was a good amount of particulate in the cup and a sludge-like suspension left in the bottom of the cup after each infusion. Unlike with the green sample, I didn't have a very strong reaction to the cha qi of this tea. I felt the same sort of head heaviness, but no warmth whatsoever. To be fair, I did assume a more leisurely pace through this tasting, so that may have had some effect, but I doubt it was entirely due to a delay between a couple of infusions. This cha qi stuff sure is mysterious. Though I liked this more than the majority of the shengpu I have tried, it wasn't my favorite, especially after trying the green sample. This red sample was much more temperamental, and generally less stimulating than the green. This is the only sample to have survived in a (more or less) single chunk. Still not too hard to pry apart, though. The aroma is markedly different from the rest— it is very potent, full of fruity and floral fragrance, and has a bit of a twang (I don't typically use this word to describe aroma, but I lack a better way of describing it) to it. This is definitely the sweetest-tasting sample of the three. I couldn't pick out much in the flavor, except a touch of tobacco. There was a lingering, sweet hui gan which was more intense than in the other two samples, and a consistently mild astringency. This tea also stimulated a good deal of salivation, which was pleasant. I couldn't detect any cha qi in this sample. I didn't experience any of the sensations mentioned above. Also, while my jaw tightened up at the first signs of qi during the previous two tastings, (sort of like an early-warning device) nothing of the sort happened this time. I liked this tea, but not as much as the green sample I tasted first. I thought it was quite sweet and pleasant, but not all that stimulating or interesting. Alright, I am officially in over my head. 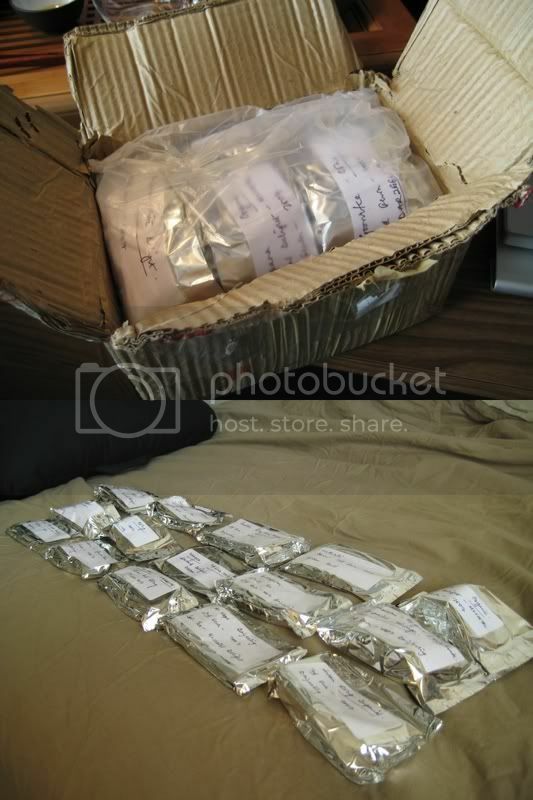 Since receiving a package full (nearly bursting from the seams, in fact) of samples from Mr. Ankit Lochan today, and being fully aware that I will soon be receiving the Dragon Tea House samples (I don't know why it's taking so long... customs, maybe? ), I have come to the realization that I will soon be completely addicted to and/or overdosed on caffeine. After having pleasant results with brewing green tea grandpa style, I thought I'd try something else. I think MarshalN once mentioned brewing shui xian grandpa style on a train or plane or something, so I figured I'd give it a try with some Lao Cong Shui Xian (not having any cheaper Wuyi laying around at the moment). Using similar parameters as with the green tea, about 4g in 135°F water, I found this to be quite pleasant. It's not as rich as if I had brewed it "gong fu" (I use quotes because I doubt my technique could truly be called gong fu) style, but it still exhibits good fruity and chocolatey character. It is more enjoyable than plain water, to say the least. "A unique aged Formosa oolong that had been roasted for an extremely long time, usually taking months, following a unique roasting-quenching up-and-down pattern. Once finished, they were stored into jars for aging. No more re-roasting or drying is needed. Surprisingly warm character and smooth liquor. Slightly acid taste balances well with a licorice-like sweetness. Very good brewing strength." Unlike the previous aged oolong I reviewed, this has undergone a different type of aging. While the 1980's Baozhong was periodically re-roasted every now and then as part of the aging process, this tea was roasted for months (!) and then stored, never to be roasted again. The dry leaves show that this tea was once in the rolled-shape, though time seems to have shaken it up a bit. It seems a bit strange that this tea isn't completely black, considering it was roasted for months (again, !). I guess this just means it was a long, slow roast, though I can't eliminate the possibility that the aging has had some influence on the color's boldness. The dry leaf reminds me of a breakfast pastry. In my ever-so-eloquent notes I wrote, "Chocolate, coffee, cream, cereal, honey. A pastry-like smell. Not very strong, but pleasant." Having previously brewed this with 5g of leaf in a 100mL gaiwan, I opted to change methods and use more leaf (6.1g) and a smaller Yixing pot (about 80-90mL) to see if I could squeeze out any more flavor. As you can see, the leaves filled the entire pot when wet. This is important because it means I couldn't have added any more leaf. Why is that so important? This tea didn't have much strength at all, even when the teapot is packed with leaf and infusion times are stretched. There was very little body throughout, and a similar amount of flavor. What was there was good, but unsatisfying. 1: Wenxiangbei is light brown sugar, with a spicy cinnamon note. Liquor has a nice sweet/cinnamon aftertaste and hui gan, but that's about it. Not a lot of flavor except for a soft roast note and some honey. Almost no body. Watery. 2: Stronger roast flavor this time, though perhaps it is slightly overbrewed. The honey flavor is predominant, except for the harshness of the roast. 3: A slight bit of the classic aged, fruity character of aged oolong is found in the wenxiangbei. The fruit is hard to pin down... raisins, maybe? The same is found in the liquor. It's a strange flavor... it has the characteristic aged taste, but without anything to accompany it except some roast flavor. I guess the honey noted earlier isn't strong enough to compete. 4: Same as last time, but less flavorful. I wonder, is this tea just past its prime? Did it go stale? Would another roast reawaken it at all? Perhaps I'll save some for when I work up the courage to try roasting tea again. I've only tried it once before, and let's just say I ended up with some very expensive charcoal. For now, though, I would rate this tea a 4.5/10. ...is the devil's workshop. Ever since Adrian and I had a conversation about making the gong fu tea ceremony more reflective of our own culture and less of an imitation of Chinese culture, I've been trying to come up with something, nay, *anything* that could be incorporated from our traditions. Then I found my propane torch (originally purchased for making crème brulée), and thought "Hmm... now what's more American than setting fires and blowing sh*t up?" Firstly: No, I am not seriously considering incorporating a propane plumbing torch into my everyday tea making routine. It might be entertaining every now and then, though. Of course, coming up with the idea of using a blowtorch is significantly easier than devising a task for it to perform. 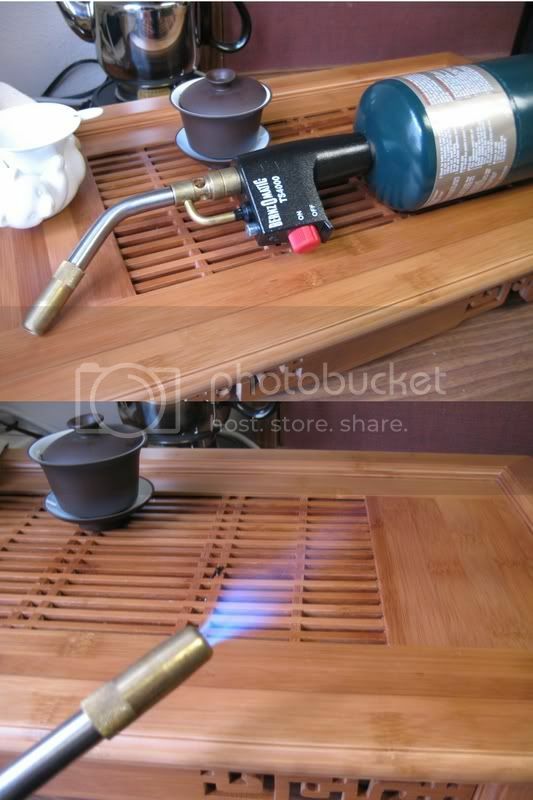 I don't think it is well-suited for delicately roasting tea leaves, and frankly there just isn't very much else that I could light on fire except for my bamboo tea tray, which I would prefer to keep un-charred, if possible. The best I could come up with is using it to prewarm a gaiwan or teapot (which it could do beautifully, with quite a bit of gusto to boot), but I'm a bit nervous about what would happen if I did. Unfortunately I have already thrown away my broken teapot, so I can't use it as experimental blowtorch fodder. This is a "before" picture of my Yixing pot that is currently undergoing an intense artificial seasoning. It seemed to work very well for one of Salsero's teapots (actually, it was the same as the one I just broke), so I figured I'd give it a try. Basically, I'm letting this teapot sit submerged overnight in a combination of Wuyi yancha rinses, leaves, and water; then I dump the soak, and add fresh used leaf and water. I'll post a new picture for comparison when I'm satisfied. I tried glass brewing for the first time today. I don't know how I haven't gotten around to it yet, but I suppose it's always better late than never. I used 3 or 4 grams of a free sample of "Pre-Ming Zhe Jiang Mao Jian" green tea I received along with a recent Jing Tea Shop order, and warm (about 140°F, I would guess) water, refilling when necessary. It was actually pretty refreshing, and quite a bit more convenient than using a gaiwan. I'll definitely try it with some other teas. Ankit Lochan from Lochan Tea has generously offered me 15 oz. of assorted Indian teas for free. Stay tuned for some reviews! 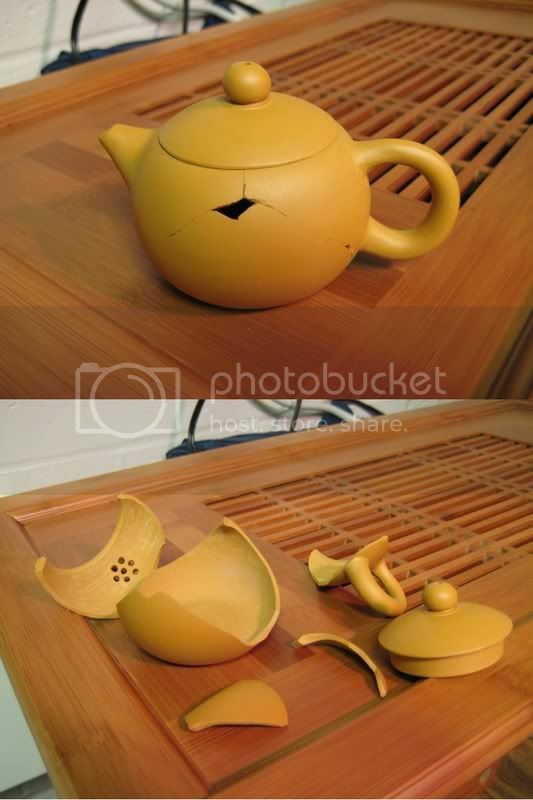 I just moved back into my dorm today, and while unpacking I found that one of my Yixing pots had been broken. Luckily it was one of the relatively inexpensive ones, but it was still a disappointment. It was also the only thing broken in the move (so far), so I suppose things could be worse. 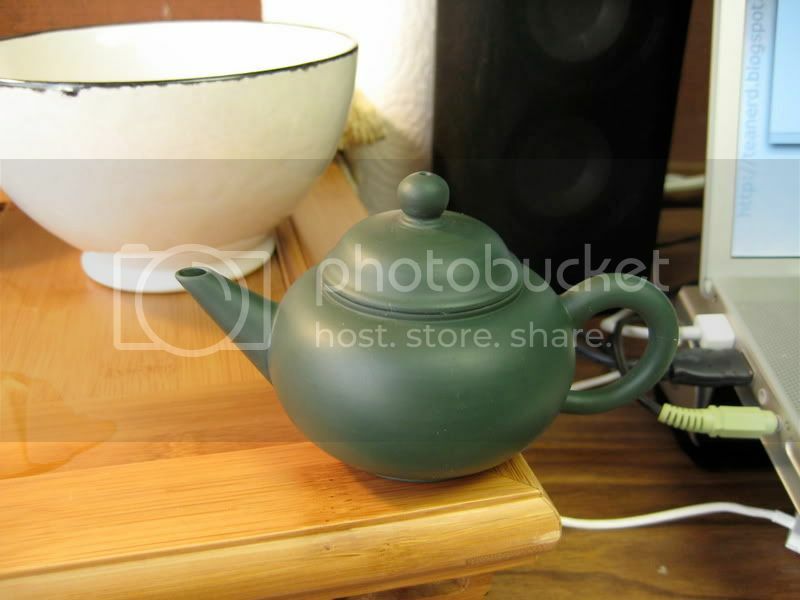 Though my teawares are all set up neatly on my desk and shelf, I am currently without any tea. Everything is stuck in the painfully inefficient and bureaucratic Vanderbilt post office. Anyway, I still have a few days before class starts, so I should have time to write one or two posts. After that... only time will tell. As you may have noticed, I have a good deal of Wuyi yancha (yancha means "cliff tea," referring to the landscape where these teas are grown) lying around. I guess I can't hide it anymore— I love this stuff. 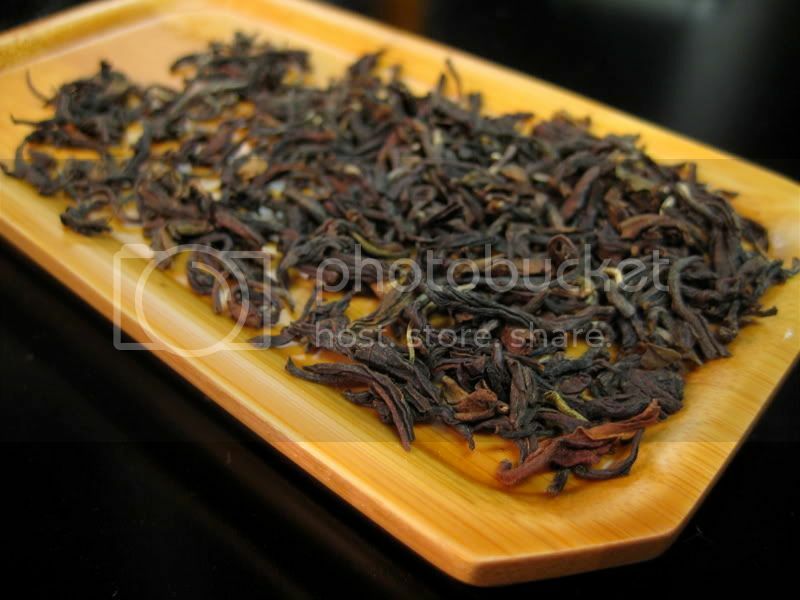 This Da Hong Pao from Harney & Sons was purchased after a recommendation from Salsero. According to the product description, this tea is about 40% oxidized. To be honest I haven't paid all that much attention to oxidation percentages so I have no idea what this number means in terms of taste/wet leaf color/etc, but it's good to know I guess. The dry leaf is dark, either black or dark chocolate brown. The aroma is surprisingly strong, smelling strongly of rhubarb, as well as some chocolate and raspberry. Unlike most dark roasted teas though, there is almost no charcoal aroma whatsoever. I'm not really sure what this means— I guess it's indicative of a lighter roast, but I don't really know. If any of you have any thoughts, I'd be happy to hear them. The liquor is nice, with flavor echoing the tart rhubarb from the dry leaf fragrance. There is also a pleasant caramel sweetness, a mild dry spiciness, a light but long-lasting chocolate aftertaste, and a decent amount of body. While this tea has a lovely, round flavor profile, it seems a bit adolescent and awkward in that it is conflicted about whether its roundness should be centered around younger, brighter flavors or deeper aged ones. Still, it's good stuff, and certainly interesting despite its bold flavor. Overall, I'd give this tea an 8/10. With a bit more age (and maybe a re-roasting to give it more of a fired flavor), this tea could develop quite spectacularly. This tea is unlike any Wuyi yancha I have tried. As this tea wasn't subject to nearly as much roasting as most of its cousins on Wuyi mountain, its leaves are lighter in color, ranging from light brown/orange to green (you can see a better picture of the leaves here), and they are long and wiry. 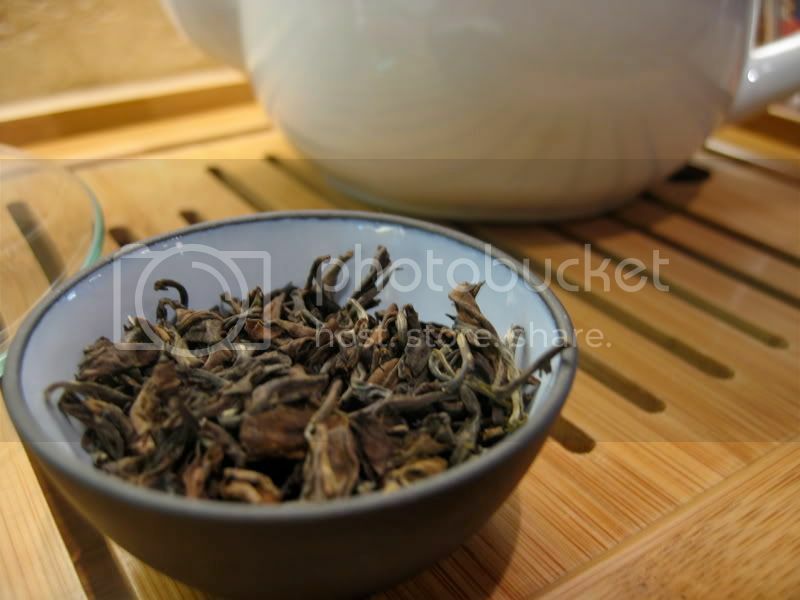 The aroma is floral and perfumey, and smells like a combination of a first flush Darjeeling and a dancong. The liquor is very light in color. It tastes of flowers (orchids, I suppose, but I don't eat a lot of flowers so it's hard to say) and light honey, and has a hint of woodiness. Balsa wood comes to mind, but I don't know why. This woodiness is much more pleasant than the kind I found in the Meghma oolong, and tends to increase in intensity as the brewing time is extended. Almost everything about this tea reminds me of dancong. It even has the same sort of astringency as a dancong, which I can best describe as the taste one gets from walking through a spritz of perfume/cologne with one's mouth open. Sounds weird, I know, but it's the best I can come up with. The tea seems patient, releasing flavor for a good number of infusions, but the lack of body leaves me feeling... underwhelmed. The wet leaves are quite impressive in constitution, I assume because they haven't been fired as much as most Wuyi oolongs. Most of the leaves are intact, and there are very few small pieces. There are also some two leaf + a bud complexes, which are always fun to find. Overall, I think if you like dancong you will like this Bai Ji Guan. I'm not a huge dancong fan, so I didn't care much for it, especially considering its price. 6/10. Also see Adrian's notes on this tea. 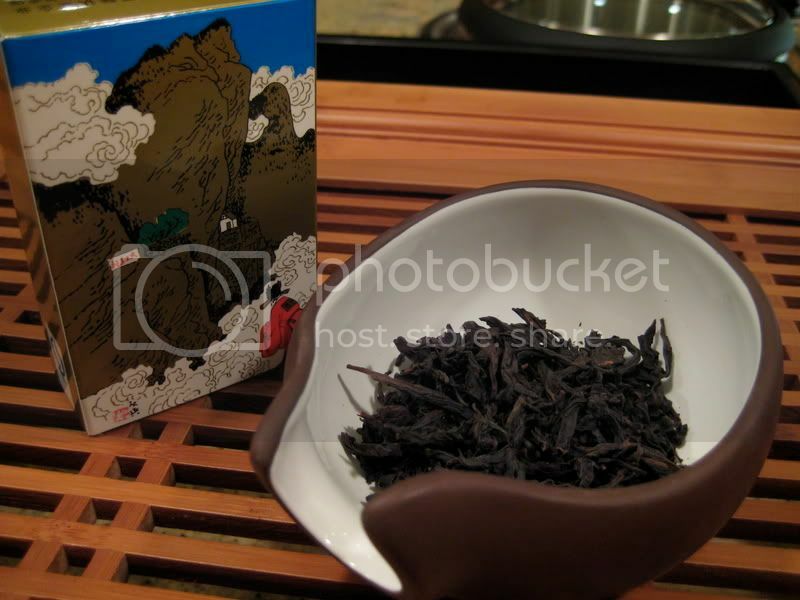 These leaves are very dark, and definitely look high-fired, as is indicated in this tea's description. The aroma is nice and strong, though not mind-blowing, and it somehow seems to sit in the nose for much longer than one would expect. Though it has nothing to do with the tea itself, the box the packet came in is pretty cool. It features an illustration of the original Da Hong Pao tea bushes, and has a guy wearing—that's right—a big red robe. The smell cup aroma is amazingly strong— sweet, fruity, and chocolately. As Adrian pointed out, this tea seems young. The liquor has bright but somewhat underwhelming flavors (chocolate/charcoal and light, sweet tropical fruit) and almost no body. Some age might just mellow this tea's charcoal and give it a richer, fuller mouth-feel. Interestingly, this tea is quite easy to brew. I couldn't get that full, velvety body I crave in wuyi yancha, but it was almost impossible to brew an unpalatable infusion. I look forward to trying this tea after it has had some time to mature. There definitely seems to be potential here— a bright, strong aroma and a strong charcoal note from high-firing. Still, despite it's potential, this tea isn't the best to drink right now. So, it gets a 7/10. The jury is still out on whether it's worthy of the "Cha Wang" ("Tea King") title, not that it really means anything anyway. These reviews are part of a T Ching Online Tea Tasting, much like the one I participated in previously. Thank you to T Ching for these teas. For a minimal $3 shipping charge, I received around 20-25g of each tea, which is quite a gift. It was also quite fortunate since it took quite a few tries to figure out the Meghma oolong (though I still haven't really gotten the hang of it). The focus of this tasting seems to be on unconventional teas from the Indian subcontinent, which seems to be an underrecognized genre in the tea blogging community. Anyway, without further ado, I present the Kashanganj Snow Bud and Meghma Nepalese Oolong. I don't know a lot about the different styles of snowbud, but to my untrained eye these leaves are quite pretty and reminiscent of silver needle (bai hao yin zhen). Unfortunately I have a head cold right now, so my olfactory senses are limited and I can't really pick up on any dry leaf aroma. Nevertheless, this tea is looking good so far. Not surprisingly, the liquor was nice and light. It reminded me of a light, sweet first flush Darjeeling, with a bit of a dancong-like perfumey astringency in the second infusion. The aroma cup initially smells of white sugar and vanilla, which develops into a very strong vanilla cake frosting aroma in the second infusion. By the third infusion, the liquor tasted like little more than sweet water. I probably could have given a fourth infusion more time to extract more flavor, but I felt that I had already gotten a good impression of the flavor so I didn't bother. I'm not much of a white tea fan since discovering the vast range of oolongs out there, but I can still appreciate the good quality of teas like this. 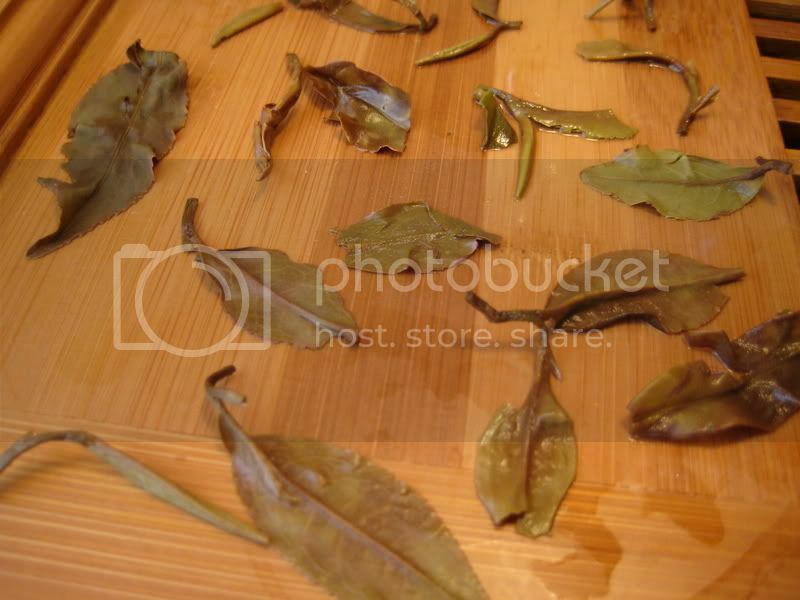 I know nothing about how wet white tea leaves/buds should look, so I won't even bother trying to analyze them. :) Still, here's a picture if you'd like to take a gander for yourself. White teas aren't my favorite, but I liked this one. It had good flavor, and there was nothing offensive about it. The dancong-like edge was just enough to make me think, "hmm... interesting," and earned this tea a solid 6.5/10. Looks almost exactly like an Autumnal Darjeeling, and smells similar too. The leaf color varies from near-white to dark brown, common in teas of this region (though I would think it has far more to do with processing than terroir). Pretty! Oh boy. I've tried three different methods for brewing this tea: gongfu with long infusions (30+ seconds), European style with a big-honkin' cheap teapot, and gongfu with short infusions (10-15 seconds). 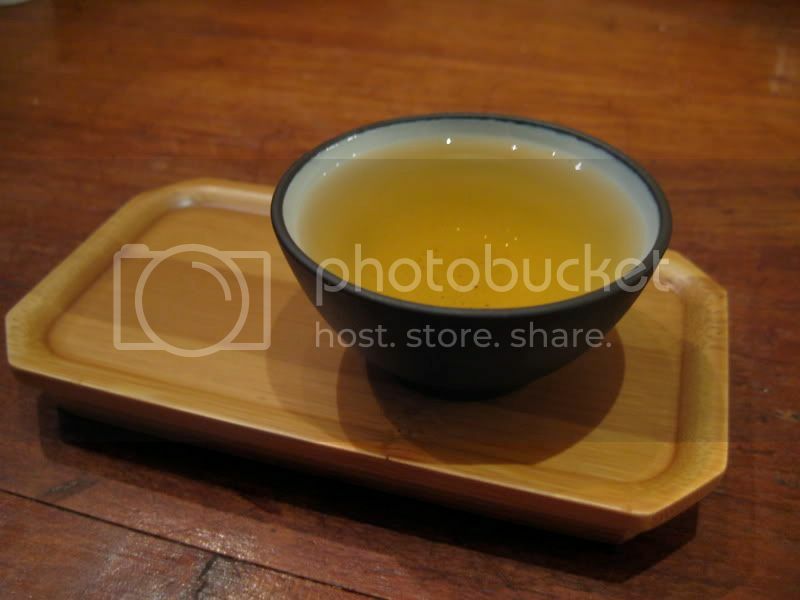 Gongfu with long infusions was absolutely dreadful, and left me feeling a bit sick. Clearly, this tea is not meant to be brewed this way. I later tried brewing it European style (4g leaf; 8oz off-boiling water; 2:30, 1:00), and had more success. I tried gongfu one more time with shorter infusions, and got better results than the first attempt, but I couldn't seem to keep the infusion times short enough to enjoy the tea. During my gongfu attempts, the liquor was extremely woodsy tasting, and not in a good way. If I had to describe the woodsy flavor, I would say it's like a very insipid and alkaline thyme, but I'm not sure if that really makes any sense. When I brewed it European style, the liquor was much more similar to an Autumnal or second flush Darjeeling black tea (though its status as a black tea is debatable). Though there is still some woodsy flavor, it is much more subdued and a bit interesting. Perhaps if I hadn't already tasted it in concentrated form, I would have found it enjoyable and intriguing. At any rate, I found the second infusion to be particularly nice— no woodsy flavor, and a sweet fruitiness characterized this brew. I was actually quite pleasantly surprised by the wet leaves of this tea. As you can see in the picture, there are many whole leaves and some intact leaves/bud/stem complexes. This tea certainly appears to be hand-picked. 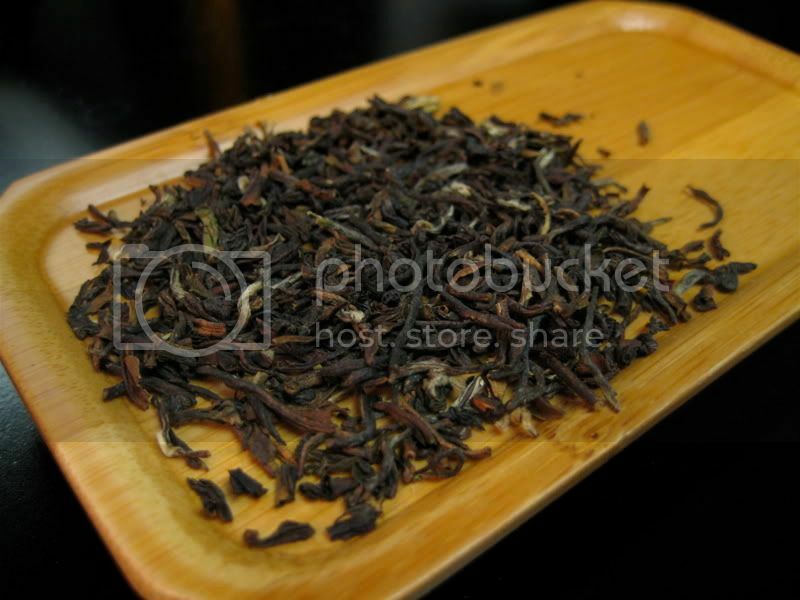 The leaves are a dark brown color, indicating a near-black tea level of oxidation. While I can certainly see that this tea has been picked and processed with care, I simply didn't like it. Frankly, I felt a bit sick after my last gongfu attempt, which definitely does not earn it high marks. Still, I can't help but think that it's the Indian and not the arrow (yes, I realize the irony of using the word Indian in this context, but you know what I mean). Even my best results tasted lackluster compared to a good second flush Darjeeling, and after reading outstandingly positive comments by Phyll, I get the feeling I'm just brewing this wrong, so I can't give it an awful grade. So, instead, this tea gets a 3/10. I'm sure it gets better than this, but if it's this hard to get right, I don't think it's worth it. While I enjoyed the teas in the last T Ching Tea Tasting more, it's hard to whine about free tea. I had been curious about Indian/Nepalese oolong for some time now, and even though I may not have had the best experience, it was still worthwhile. The real dark horse winner in this tasting was the Doke white tea— I didn't expect much but I actually liked it quite a bit for a white tea. Once again, thanks to the great people at T Ching! Recently, I met up with my girlfriend in San Francisco to meet our friend for lunch and then see a Giants game. We ended up going to "The Slanted Door," located in the Ferry Building. As we walked around to kill time before lunch, lo and behold, we stumbled across an Imperial Tea Court store! We debated about whether we had time to sit down and have some tea, and I convinced her that we did (we didn't). I looked through their "Imperial" selection of teas and settled on their bao zhong, opting for gaiwan service. Recalling a suggestion from another SF Bay Area tea-head whose name escapes me, I asked for cups to decant into— if you don't ask, you have to sip from the gaiwan. Our server was very friendly, and was helpful but not overbearing. He had worked there for two years so he knew what he was doing, but didn't pester us with lessons on how to brew our tea (though I'm sure he would have, had we asked). The bao zhong was actually quite good, exceeding my expectations (until I saw the price tag on the loose leaf... ouch). I didn't have full control over parameters so I might have gotten better results with more familiar equipment— I had a 6oz gaiwan and a preset amount of leaf— but the tea was still refreshing, calming, and had good flavor and body. After three or four infusions we were almost falling asleep, but luckily the tea was wearing out as well. So, we looked around a bit more and left. Then, I made one of the dumber decisions of my life and took the Embarcadero from the Ferry Building to AT&T park. It took us 45 minutes to go 1.5 miles, landing us in the ballpark right at the end of the 4th inning. Oops! Anyway, it was a good time, and I'm glad I got to spend it with such a special person (cue "awwwww!"). I don't know if I would want to go to Imperial Tea Court every day, but it is certainly worth a visit, especially if you bring along good company. Continuation of Matcha Madness: Part I and Part II. Preparing matcha with the traditional method requires quite a bit of specialized equipment, as you can see here. 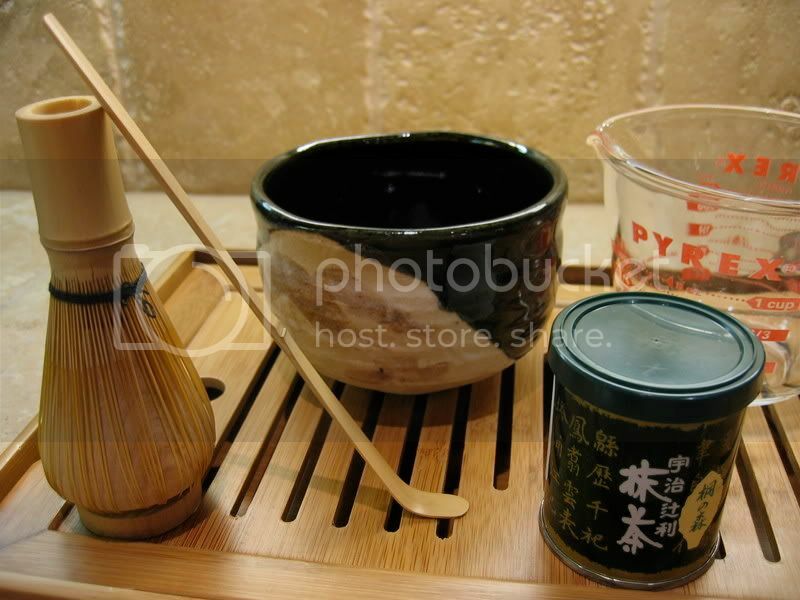 From left to right we have a chasen (whisk) held on a whisk holder, a chashaku (tea scoop), a chawan (tea bowl), a can of matcha, and a measuring cup. You don't technically need everything shown here, but I would really suggest investing in this kind of setup. So, what do all these items do? Whisk/Chasen: The chasen has two purposes; it mixes matcha powder with water and incorporates air into the mixture (think of beating an egg white into a meringue), thus forming a homogenous suspension with a foamy froth on top. This is probably the single most important item in preparing matcha by traditional means. These bamboo whisks are usually handmade by cutting a short section of bamboo lengthwise into many small tines. How many tines, you ask? The short answer is that it depends what kind of tea is being made. 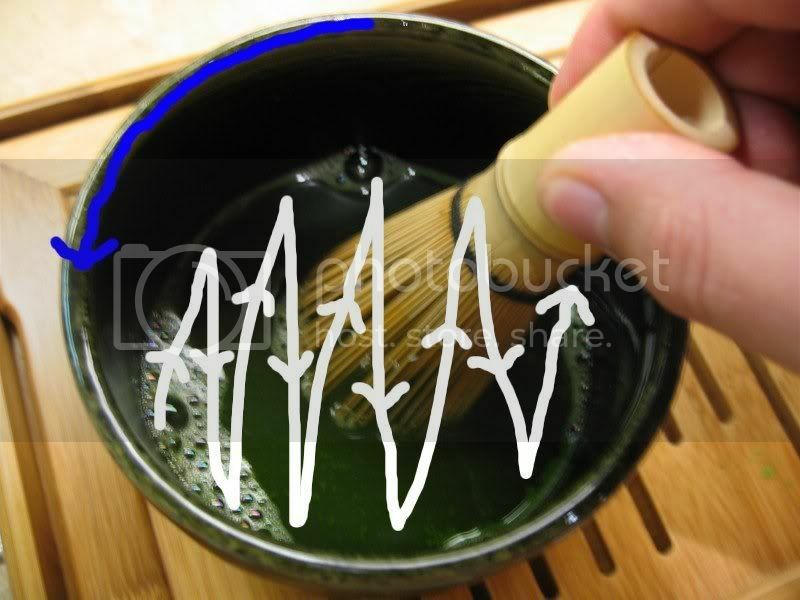 Don't worry though; as is the case with many aspects of matcha preparation, the number of tines on the whisk is important to performers of the tea ceremony and true matcha buffs, but likely makes no difference to the casual matcha drinker. So don't sweat it, and just buy whatever whisk feels right to you. Whisk Holder: This is used to maintain the optimum shape of a bamboo whisk, which is easily warped by hot water. I've seen porcelain and wooden models, but I'm not convinced either is significantly better than the other. So, once again, it's up to you. Scoop/Chashaku: The chashaku is used to scoop and measure matcha. This is not an exact measure, but the picture shown here should give you a general idea how much one scoop's worth is equivalent to. The mass of one scoop's worth is approximately 0.75g, though this can vary from person to person or from tea to tea, depending on your technique or how densely packed your matcha powder is. Matcha scoops are almost always made from bamboo, and there isn't much variation in design unless you're getting really fancy. 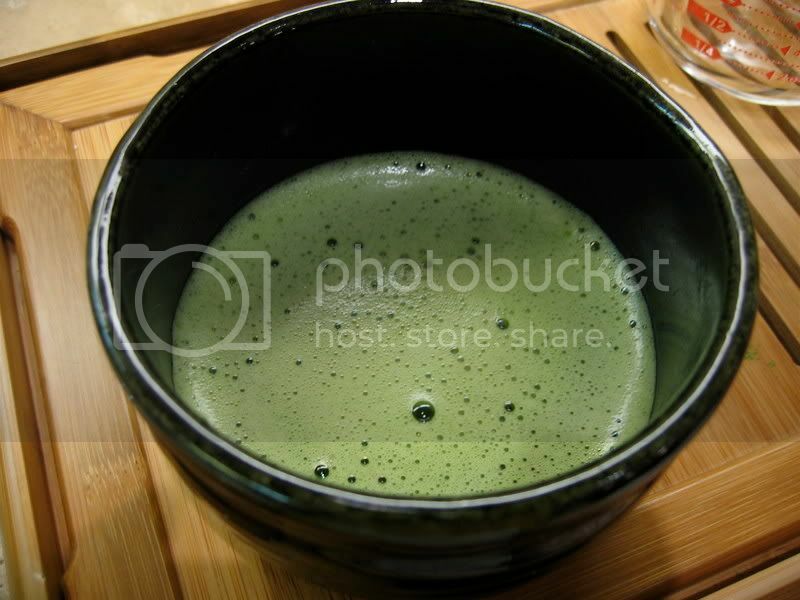 Matcha Bowl/Chawan: The chawan is the second most important item in traditional matcha preparation. It is much larger than a typical Japanese teacup, despite the fact that the typical serving of matcha is only around 4 fl oz (approx. 120mL). The larger size gives the whisk more space to move around and effectively mix the tea (more on this later). There are a number of chawan forms and styles, but I am hardly an expert in Japanese pottery or art. I think the wide cylindrical shape (like mine, or this one) is the easiest to work with, as it contains splatter much better than the flat, conical-shaped bowls (examples here and here). 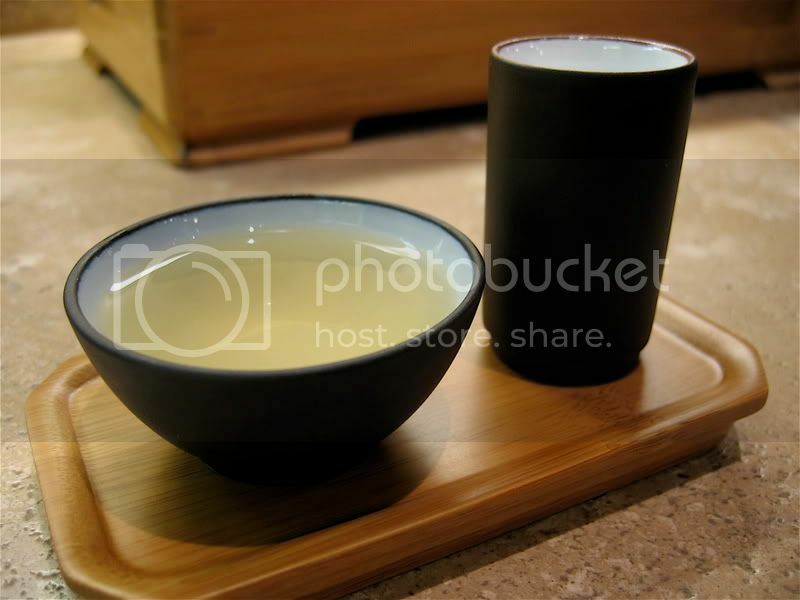 Matcha bowls can be very expensive, as you can see by the list prices on the linked examples above. These are mostly intended for Japanese art collectors and tea masters. However, there are many cheaper ones available on the internet for the rest of us. I particularly like the selection at Artistic Nippon, but almost all Japanese tea vendors carry at least few of the more affordable models. Measuring cup: Fairly obvious. This isn't really necessary once you get a feel for the ideal amount of water to use, but it's still useful if you want really consistent results. Also needed but not pictured is a towel of some sort. I just use paper towels, but it doesn't really matter as long as it can be used to dry things. First off, this is a purely functional method for preparing matcha. If you want to learn the Japanese tea ceremony, you will likely have to pay a good deal of money for the proper training. This is the next best way to enjoy matcha, and it's a lot cheaper! First, set out all of your tools in a logical order so you don't have to fuss around or think too much. Bring your water to temperature (I like 170°F or so, but temperature doesn't matter nearly as much for matcha preparation as it does for steeping loose leaf tea), and fill your chawan about 1/3 full. Rinse the business end of your whisk in the bowl, then discard the water and thoroughly dry the bowl with a towel. Both of these rinses prevent clumping later on, and rule #1 about matcha is that clumping = bad. 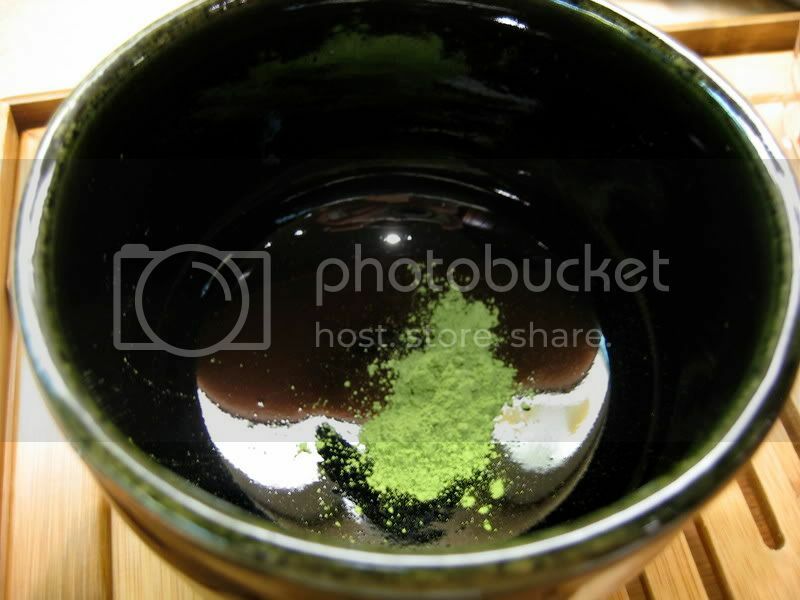 For usucha or thin matcha, add 1-2 scoopfuls of matcha powder to the warm, dry bowl. For koicha or thick matcha, add 3-4 scoopfuls. You can swirl the powder around with the scoop if you like, but I don't think it helps much. Add approximately 4 fluid ounces / 120mL of hot water (like I said before, temperature is up to you) to the bowl. Pour it somewhat slowly to keep the powder from flying. Put your recently rinsed whisk in the bowl and move it back and forth in an M or W pattern, occasionally giving the entire bowl a quarter-turn. Just like whisking when cooking, this requires a good deal of speed and elbow grease— wimpy whisking will almost definitely earn you a bowl of powdery tasting matcha. It takes about a minute of good, solid whisking to mix everything and work up a nice froth. Enjoy! When you're done, you should end up with a nice frothy bowl of matcha. Drink it fairly quickly, because the matcha powder is not dissolved and will settle out of suspension if given enough time. Settling makes the tea taste powdery, which is bad. If this happens, whisk again or just swirl it around to re-suspend. The observant among you may have noticed that I mentioned food grade matcha back in the second installment of this series. Why did I purchase so much food grade matcha, you ask? 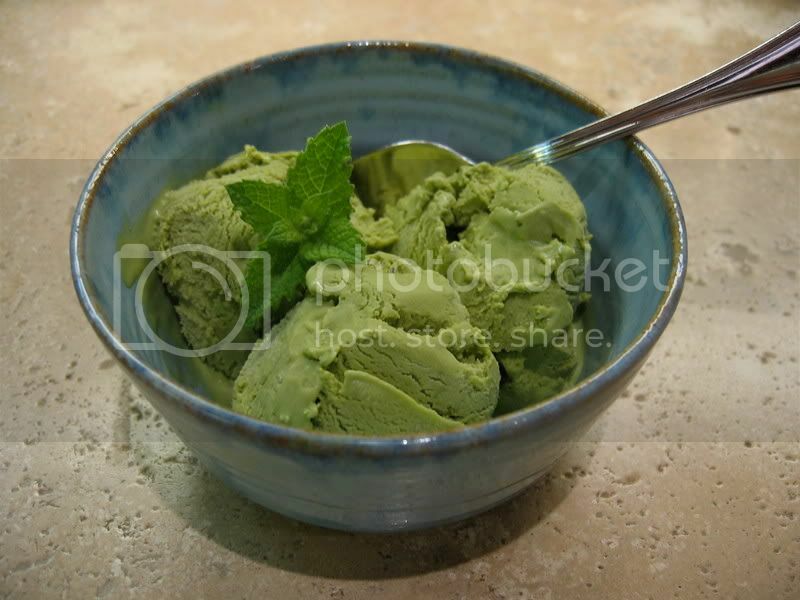 I'm not big on tea recipes, but matcha ice cream, more commonly and ambiguously known as "green tea ice cream," has always been one of my favorite desserts. So, I thought I'd share my recipe. Yes, you will need an ice cream maker. Add the cream, milk, and salt to a medium-sized saucepan. Heat until bubbles begin to appear around the edge of the saucepan (Do not bring this to a boil, or you will have a big mess on your hands). Whisk together your matcha powder and hot water in a medium-sized work bowl. Just use a regular kitchen whisk (not a chasen), and don't bother trying to whip up a froth; not only is it extremely difficult, but it is entirely unnecessary. This step is just to reduce any powdery consistency in the final product. To the matcha and water mixture, add the sugar and egg yolks, and whisk to combine. Temper the egg mixture by SLOWLY adding the hot cream mixture, whisking constantly, until about half of the cream mixture has been added to the egg mixture. I can't stress enough that you must add the cream mixture slowly. If you do this too quickly you could literally scramble your eggs. This is bad. Return everything to the saucepan. Cook the custard on low heat, stirring with a wooden spoon. Continue cooking until the custard coats the back of the spoon. If you've never done this before, this is how you know if it coats the back of the spoon: dip the spoon in the custard, and run your finger down it. If your finger leaves a mark with defined and stable edges, you're set. Take the custard off the heat and pour through a strainer into a metal bowl. Cover with plastic wrap, placing the plastic directly on the surface of the custard to prevent it from forming a skin. Place this metal bowl inside a larger bowl filled with ice water. Chill in the water bath until the mixture is cold (this should take about one or two hours), adding ice to the ice bath as needed. From this point, follow your ice cream maker's instructions. Put the soft ice cream into the freezer to harden for at least 2-3 hours, and devour. Anyway, I hope you enjoyed this three-part series. I have a couple new and somewhat oddball articles in the works, so as always, stay tuned! ***If you get the reference, you're awesome. The old order of "Kiri no Mori" (henceforth called K.M.) was purchased and opened several months ago, the new order of K.M. was receieved 5-6 weeks ago and opened in the past week, and the food grade matcha was received and opened within the past week. I should note that because I am a horrible photographer, I did have to do a little bit of editing to the photos in order to bring out the colors. (I did my best to match the actual color of the matchas, and since I'm not selling anything I have no desire to present false information.) Anyway, compare the color of number 1 and 3 for an illustration of the difference between fresh food grade and fresh ceremonial grade matcha, and the color of numbers 1 and 2 for an illustration of what time does to matcha powder. Color is one thing, but what about taste? The new K.M. is quite good, despite being the cheapest matcha available from O-cha.com. It is has a vibrant, rich green flavor, with plenty of creaminess and sweetness. There is only a touch of bitterness, and there is a pleasantly sweet aftertaste and hui gan. The old K.M. is still good, though there is less richness, more of a light grain taste, and a little more bitterness. It's not nearly as different from the new K.M. as I expected it to be after all this time, but it was noticeably changed. The food grade matcha is, frankly, quite awful. It is bitter, with almost none of the sweetness or creaminess found in the ceremonial grade matchas, though there is the same sweet aftertaste. To be fair, it wasn't sold for this purpose— food or ingredient grade matcha is, as you would expect, intended for use in food where delicate flavors aren't important. Even though as much as several months of storage won't turn your matcha into ash, it's still a good idea to know how to keep it properly. Just like with loose leaf tea, keep your matcha away from light, air, and moisture. Be even more vigilant though, because matcha's fine texture makes it more sensitive than loose leaf teas: smaller particles mean more surface area per volume, and more surface area means more exposure to the elements. Fortunately, most matcha vendors are aware of this, and package their product well. Generally, you will find matcha packed in a mylar bag and/or a sealed, airtight aluminum canister. At this point, the best place to store your matcha is in the fridge. HOWEVER, there are some rules about keeping tea in the fridge, and these are doubly important for matcha. The fridge is a good place to keep hermetically sealed packages because it prevents heat-related damage. Once you open the packaging though, don't put it back. The heat damage you would prevent is negligible compared to the negative effects of moisture, airflow, and odors that your tea will likely endure inside a fridge without any protection. Also, when you take your matcha out of the fridge, let it warm up to room temperature before opening it in order to avoid condensation. 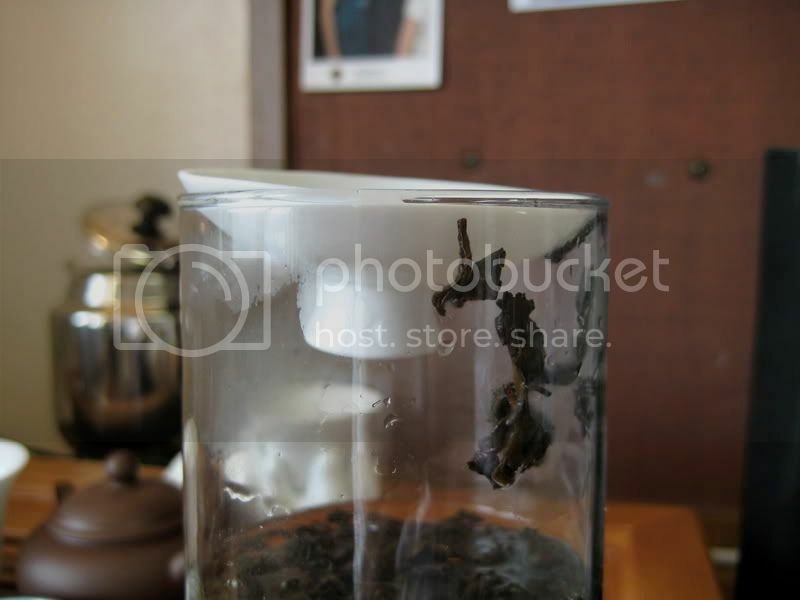 Once you open the container, keep it in a cool, dark place just like the rest of your opened packages of tea. 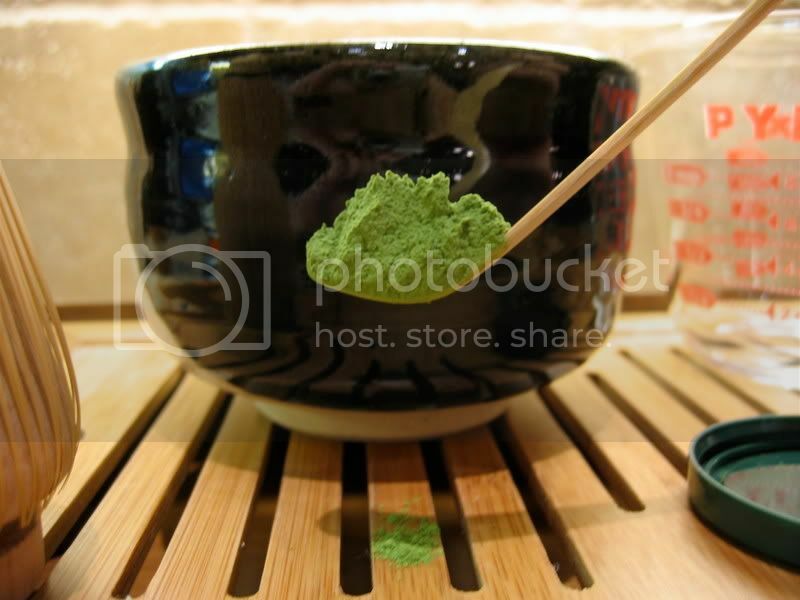 I would not suggest storing your matcha in a natsume (example) or cha-ire (example). They're really only useful in a ceremonial setting, when an unsightly aluminum can is inappropriate. If you want, you can store your matcha in a mylar bag and then put that inside the pretty container of your choice, but the important thing is that very few of these containers are airtight. Of course, if you go through matcha fairly quickly this won't be as much of an issue, but if you're like me you'll want a more long-term storage solution. In any case, try to finish it up within a few months, as that's when you begin to notice staleness. Again, we are fortunate that matcha producers know about the short shelf life of their product, and typically package matcha powder in small 30g amounts. I forget where I heard this, but supposedly matcha is traditionally sold in 30g packages because that was just enough for a tea ceremony practitioner to serve usucha matcha to 20 people without leaving any leftovers that could go stale. Chances are you won't be making 20 servings in a day, but it's the same principle. Stay tuned for the third and final installment of Matcha Madness! Matcha is one of the more unique teas out on the market today. Matcha is a Japanese green tea, ultimately derived from gyokuro. The most important use of matcha is in the Japanese tea ceremony, which I am thoroughly unqualified to explain. Though the tea ceremony is certainly interesting, my greater concern is with the tea itself. As matcha is different than most teas, it requires extra care and specialized equipment. In the next two or three articles I will briefly explain the how matcha is produced, how to select your own, how to store your matcha, and how to prepare matcha for your own casual enjoyment. Who knows, I might even do a review at the end. It all starts with gyokuro. Gyokuro is a Japanese green tea, grown under roughly 90% shade for 14-20 days before harvest, typically in the Uji and Yame regions. This produces a sweeter, richer tea. Without this shading step, the end product would be powdered sencha, not matcha, and it would have a much stronger bitter flavor. After harvest, the leaves are steamed and then dried. While leaves destined to become gyokuro would now undergo repeated rolling and drying steps, leaves for matcha (known as tencha) are not rolled but are still dried. After drying, the leaves are de-stemmed and de-veined, so that only the most tender parts of the leaves enter the next stage of production. Next, tencha is ground into an extremely fine powder. Traditionally, this is done with stone mills. Immediately after grinding, the finished matcha is packaged in airtight mylar bags and/or containers to preserve it for as long as possible. There's a nice video of the process here. For non-cooking purposes, we will be interested in ceremonial grade matcha. 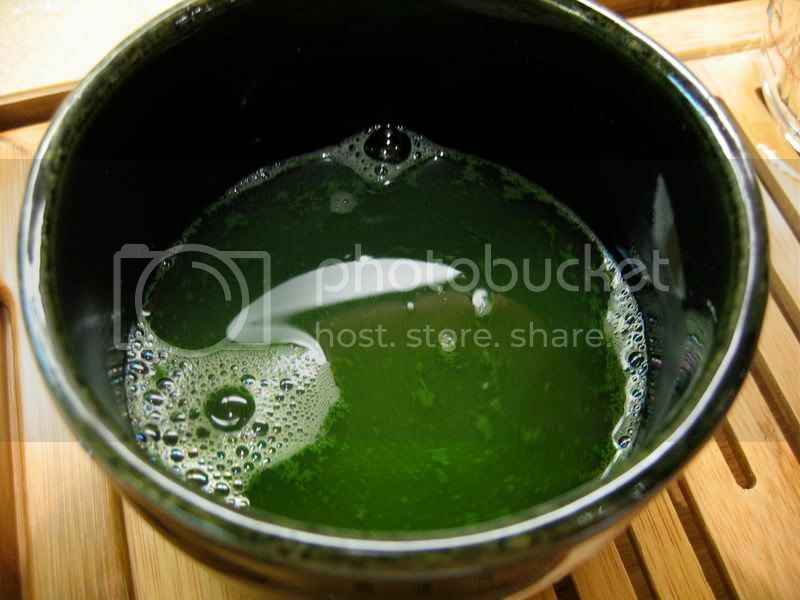 Food grade matcha can be used in matcha lattes and what not, but it's not very good by itself. Ceremonial grade matcha is often described as falling into one of two categories; "thin" or usucha matcha, and "thick" or koicha matcha. Technically, these terms refer to two forms of the drinkable tea (more on this later), but for now, just remember that koicha matcha powder, if honestly labeled, is usually of superior quality than usucha matcha powder. There is no technical difference between the two kinds of matcha powder other than quality (it is similar to words like "premium" and "select"), so take such descriptions with a grain of salt. Anyway, a few trustworthy vendors I've heard good things about or personally ordered from are O-Cha.com, Hibiki-an, and Zencha.net. These should get you started, and you can branch out from there. Hibiki-an, "Four Seasons of Green Tea"